Visit any supplement or health food store, and you'll find hundreds of products designed to help you gain weight. But these products aren't essential for weight gain -- you can get the calories and nutrients you need to put on weight healthfully from the same foods that likely already make up your healthy diet. Opt for calorie-rich foods that are high in a few key nutrients to gain weight and muscle without shelling out cash for supplements. Make protein-rich foods part of your daily intake for weight and muscle growth. A diet to bulk your muscles should contain higher-than-usual amounts of protein, since you'll need more amino acids to create bigger muscles. To get your daily needs, multiply your weight in pounds by 0.8; that's 92 grams of protein if you weigh 115 pounds, 116 grams of protein if you weigh 145 pounds and 136 grams of protein if you weigh 170 pounds. Try boneless, skinless white-meat poultry -- like chicken breast -- to get the amino acids you need for muscle growth. Each 3-ounce portion supplies 16 grams of protein, while an equivalent serving of turkey breast offers 26 grams. You can also get high-quality protein from dairy; an ounce of mozzarella cheese, for example, has 9 grams of protein, while a cup of milk has 8 grams. Soy milk can serve as a source of protein in place of dairy milk; it also has 8 grams per cup. Incorporate fatty fish in your diet a few days a week to support muscle growth. Like poultry and dairy, fish offers high-quality protein; a 3-ounce portion of salmon or tuna contains 22 grams, but it also supplies healthy omega-3 fatty acids. Omega-3 fats help lower inflammation, including the post-exercise inflammation that would otherwise lead to post-workout muscle soreness, reports a study published in the Journal of Sports Science & Medicine in 2014 As a result, the healthy fats in fish might help shorten your recovery time between workouts, so you can put your full effort into strength training for muscle growth. 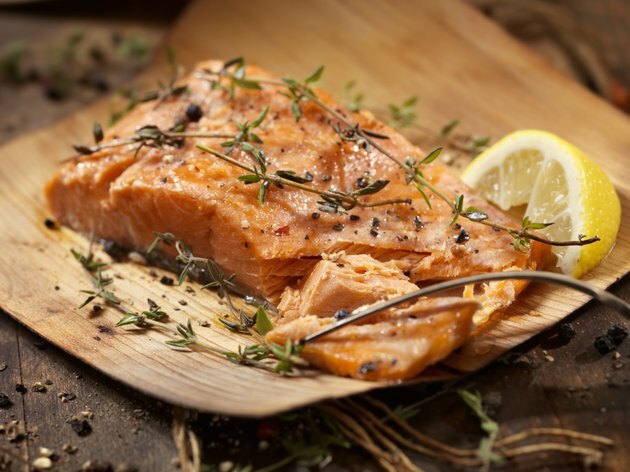 Herring, salmon, trout, tuna and sardines all provide essential fatty acids; for example, a 3-ounce portion of chinook salmon offers about 1.5 grams of omega-3 fatty acids. Fatty fish aren't the only sources of healthy fats in a weight gain diet-- you'll also get high-quality unsaturated fat from plant-based foods. Unsaturated fats not only come packed with calories for weight gain -- a tablespoon of olive oil, for example, has 124 calories -- but they also benefit your blood cholesterol levels and protect you from cardiovascular disease. Cook with olive oil and snack on nuts, seeds and avocado for unsaturated fats. Include flaxseed oil, flaxseeds, chia and walnuts in your diet as plant-derived sources of inflammation-fighting omega-3 fatty acids. While protein often takes center stage when you're trying to grow muscle, eating high-quality carbohydrates is just as important. Your muscles store carbohydrates in the form of glycogen, which you can use as a quick source of energy during your workouts. Eating enough carbohydrates allows you to continually replenish your muscles' glycogen stores, so you feel energized and powered up during your workouts. Get healthy carbs from whole grains -- such as oatmeal, brown rice, and 100 percent whole wheat bread -- milk, yogurt, fruits and vegetables to fuel your muscles. Beans and legumes also offer high-quality carbohydrates for energy; they supply protein to nourish your muscles, so they're beneficial in a weight gain diet. While certain foods supply nutrients that support weight gain, you won't see significant results if you don't look at the "big picture," which means ensuring you eat more calories than you need and following a strength routine that supports muscle growth. About 250 extra calories per day are essential for weight gain of 1/2 pound per week. If you aren't eating enough calories, you won't have the extra energy you need to gain weight, and if you're not strength training, you won't gain muscle. You might also need to take other steps to notice significant muscle gains, including improving your sleep hygiene to get 7 to 8 hours of high-quality sleep each night, and a stress management program to maintain healthy stress hormone levels. Talk to a professional to develop a program uniquely tailored to your needs; the more personalized your approach, the better your results. How Much Protein Should I Take to Gain Weight? Is Sugar Bad for Muscle Growth?